The Art Deco Diner Booth represents a fully upholstered booth of classic design. 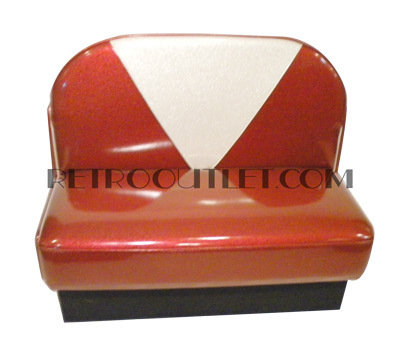 The Art Deco Diner Booth is our exclusive design and provides comfortable seating for four. Pictured in the very popular upgraded Burgundy (Red) Zodiac Vinyl with contrasting Insert V and Piping in Silver Zodiac Vinyl. 24″D x 60″W x 36″H (6 person seating) – Order Table Size: 30″x60″ (Table Length requires 2 bases for stability). Please allow 4-5 weeks for production of the Art Deco Diner Booth in your choice of colors.